The 1st page of any Google’s Search Engine Result are like the 10 seats in the VIP lounge. If you can muster strong seo services, connections and pull the right strings to help you join the VIP’s and keep the hecklers away – you will gain a vantage position without any obstacles. This gives you a guaranteed competitive advantage as people make 100 billion Google searches per month which is equivalent to an average of 3.3 billion searches every day. This reiterates the potential of our SEO services which is one of our core competencies at Dharne, that our elite clients can harness. SEO is not just about optimizing pages for search engines. It also involves giving the user a rich web experience. The traditional techniques and practices of performing SEO do not necessarily work today. This does not indicate that you need to scrap out all the old techniques, NO! What we mean is Search Engines have evolved in a better way and have grown smarter to identify ‘SEO spam’. Today, it is safe to say that Good SEO + Awesome User Experience is the essence of a quality website. 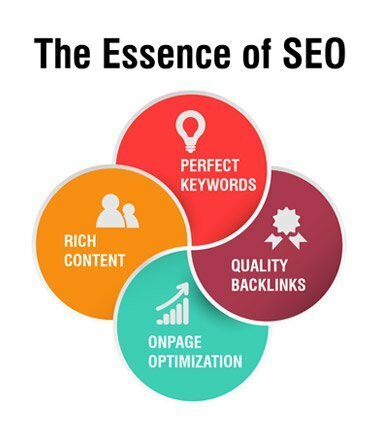 In today’s competitive online environment, with more and more businesses learning about the importance of an online presence, one needs to implement diverse SEO strategies to beat the competition and stay ahead. Just to give an example, we can assume that there are about 200 ranking factors which might be used by Google to determine rankings in their SERPs (Search Engine Result Pages). This states that SEO is not a piece of cake anymore and you need professional SEO services to take care of your website optimizations. Search engine optimization (SEO) is what increases your chances of being found when customers search for a product or a service on Google, Bing, or other search engines. And if you don’t show up in these results for the relevant search terms , you simply don’t exist! Dharne & Co. seo services help you rank higher for relevant targeted keywords using proven strategies & “white-hat” techniques. By leveraging our seo services we help build targeted content backed by effective action plans to attract visitors and grow traffic. Our dedicated efforts help you convert visitors to potential customers. On page SEO: Everything on the page. This includes all the content that you put up on your website and the HTML tags that tell the Search Engines about your content. This aspect of SEO is completely under your control. Off page SEO: Everything off the page. This primarily includes all the links that come to your website from other websites. This is partially in your control however with great strategy it can help achieve your SEO objective. Your page’s URL should be short and contain your Keyword. Avoid ugly URLs like, www.example.com/p=12?. The page URLs should be easy to remember and shouldn’t include unnecessary parameters as mentioned above. The title tag is the most important on-page seo element. Whenever the user types some search queries on the search engines, the result pages are populated on the basis of relevancy to the searched keyword. The title tag is the first location where the search engines look for that keyword. A website with only text becomes mundane for the users. Using images, videos, and illustrations increases the on page time thus decreasing bounce rate. Also they help users to understand what we are trying to say, rather easily. Having outbound links from your website to relevant websites act as a relevancy signal for Google and other search engines. Just keep in mind that these outbound links should go to authority websites like Wikipedia. The heading tags, or to be precise the H1 tag, should be properly checked and inserted into every page of your website. The H1 acts as a secondary title of your page and it is important that you convey exactly what your page talks about through this tag. Social media sharing is a vital part of today’s SEO. Google considers these social signals as an indication of helpful content for users. Hence it is your job to make it easier for your website visitors to share the content which they read on your web pages. This can be done by implementing social sharing buttons for famous platforms like : Twitter, Facebook, Google+, LinkedIn, etc. The content on your website should be authentic, helpful and easy to understand for the users. A bounce – when a visitor quickly leaves your website – is used by Google and other search engines as an indicator of the site’s relevance. Building a clean website design, adding internal links and writing engaging content helps in reducing bounce rates. LSI keywords are synonyms to your targeted keywords. Google uses them to determine relevancy. Creating top-quality content and promoting it on high PR (page rank) websites is the essence of content marketing. Unless you have a solid content marketing strategy even top quality content will not do it for you. Since, creating top quality content without it being visible is of no use. The content marketing strategies widely increase your scope & accessibility thus ensuring that your valuable content reaches your target audience as much as possible. Promoting your website on social media platforms like Google+, Twitter and Facebook makes it easier for users to get to know about your products and services. Using Google My Business and Google+ helps you to get enlisted in Google’s search engine results rather quite easily. Competitor Analysis to learn and identify key elements to build a goal-oriented strategy. Website & content optimization to make your website informative for visitors and search engine friendly. Localized SEO services to enhance your presence in the area you are currently based in. View the FAQs to get to know more about what we have in store for you.